Find out just how beneficial fallen leaves are for your yard. For many homeowners, the fall season signifies weekends full of raking leaves and trying to fit them awkwardly into yard bags (which always seem to be smaller than the head of the rake). Some trees are notorious leaf droppers, and you may have to rake leaves, acorns, needles and “helicopters” from September through December. Although it may feel like you’ve raked a million leaves (and you may even wish you didn’t have trees at all), the fallen leaves in your yard have tremendous beneficial power to your yard’s ecosystem. Understanding how to best remove leaves and use them to your advantage will make this chore feel worthwhile. Fallen leaves offer many benefits to the landscape and smart gardeners hold on to excess leaves so they can add beneficial nutrients to their garden all year long. Leaves can absorb water, prevent run-off and put necessary nutrients back into the ground. But some leaves are large, and don’t break down as quickly. That’s why many gardeners look forward to mulching their leaves as it can be used for multiple purposes like mulching around shrubs and plants, it can be added to the compost bin, spread on top of raised beds as soil amendment, and used as fertilizer on lawns. In fact, new studies have shown that chopped leaves left on lawns can actually help reduce weeds. A leaf-only compost pile will eventually break down and turn into leaf mold, which is full of powerful nutrients for the yard. 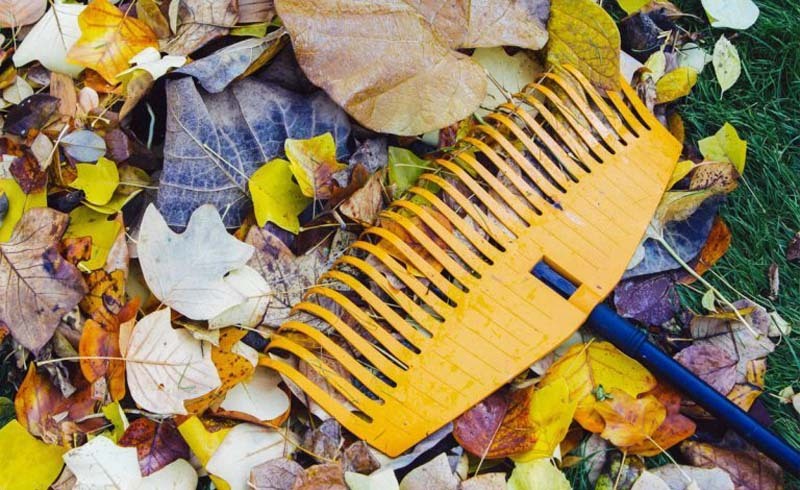 Use a leaf blower or rake to get leaves off of the lawn, off of the driveway as well as walkway, when they are dry and lightweight. The trick is to get the leaves into your yard waste bin quickly and easily so you aren’t spending all day doing this task. There are many specialized tools like tarps, buckets or hand rakes and you may need to experiment with the best method that works for you. Keep in mind that most regions have banned leaf burning so you will need to legally dispose of your leaves. Although this may feel like a real chore, it’s better to rake often rather than to wait until all the leaves have fallen. Leaves are very heavy when wet and you may find them too heavy to actually lift into a bag. Additionally, whole, wet soggy leaves (not shredded leaves) aren’t good for the health of the lawn as it can suffocate and encourage pests and disease like snow mold. Chances are your grass is still growing even in the fall, so you’ll want to keep whole leaves off of the lawn. When grass blades are ready to grow in the spring, significant leaf coverage can make your spring lawn look unhealthy and unattractive. Some lawnmowers can be fitted with a mulch or shred blade, which works well to cut leaves into tiny pieces and turn them into mulch. First blow the leaves on to the lawn, set your lawnmower’s shred blade up high (so you don’t cut the grass blades too short), and continue to mow over the leaves until they have been shredded into small pieces. Mulched leaves can actually benefit the health of the lawn and can help add nitrogen. Just make sure that you spread it evenly over the lawn can still see the blades of grass through the mulched leaves. Landscape companies, especially those who specialize in leaf removal, offer their customers a really fast way to remove leaves by use of a specialized vacuum. This vacuum is often attached to a truck that can hold a large amount of leaves. 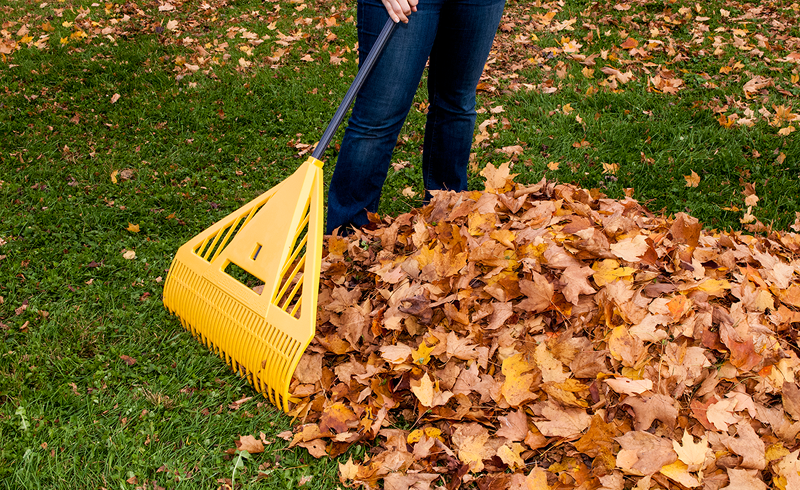 The landscapers may first blow, rake or push the leaves to a giant pile where it can be quickly vacuumed. This is a great way to remove a lot of leaves at one time and is ideal for large properties.